All of the 'classic' problems of TCP networking: firewalls, proxies, timeouts, DNS issues, and so-on can affect Octopus Tentacles. This guide will help to track down these issues when either a machine cannot be "Discovered" (Listening Tentacles) or "Registered" (Polling Tentacles) with the Octopus Server, or a previously working machine fails a health-check with errors from the networking stack. Before following the steps below, it can be worthwhile to restart the Octopus and Tentacle services, and refresh the browser you're using to connect to the Octopus Web Portal. Neither action should fix a communication problem, but sometimes they can help flush a problem out. Open the Octopus Manager app, and select Restart. Alternatively, open the Services app, find OctopusDeploy, and click restart. Open the Tentacle Manager app, and select Restart. Alternatively, open the Services app, find OctopusDeploy Tentacle, and click restart. If you get to the end of this guide without success, it can be worthwhile to completely remove the Tentacle configuration, data, and working folders, and then reconfigure it from scratch. This can be done without any impact to the applications you have deployed. Learn about manually uninstalling Tentacle. Working from a clean slate can sometimes expose the underlying problem. Before continuing, it's worth briefly revisiting the concept of Listening Tentacles and Polling Tentacles. As you troubleshoot problems with your Tentacles, please pay attention to which communication mode they are configured for. When an Octopus Tentacle is configured in Listening mode), it will open the specified port (by default TCP port 10933) and listen for inbound connections from the trusted Octopus Server. When an Octopus Tentacle is configured in Polling mode, it will attempt to connect to the Octopus Server on the configured TCP port (by default TCP port 10943 on the Octopus Server) and poll the Octopus Server for work to be performed. If the machine has been included in a Health Check or Deployment, examine the Raw Task Log. There's a link to this on the page containing the details of the Health Check or Deployment, which can usually be located using the Tasks page in the Octopus Web Portal. On the Infrastructure page of the Octopus Web Portal, click on the problem machine and select the Connectivity tab. There's often specific information about the communication status of the machine here. In the Octopus Web Portal, open Configuration ➜ Diagnostics. Information on this page can be helpful to work out what's going on in the Octopus installation. Look at the information under Server logs and searching for the machine's name or IP address can turn up useful information. If you're successfully connecting to the Octopus Web Portal with your web browser, you can be confident the Octopus Server service is running. The Tentacle Manager usually shows correct service status, but it pays to double-check. On the Tentacle machine, open the Windows Services Control Panel applet (services.msc) and look for "OctopusDeploy Tentacle". Verify that the service is in the "Running" state. If the Tentacle service is not running, you can try to start it from the Services applet. Allow 30 seconds for the service to start work, then refresh the Services screen. If the Tentacle service keeps running, go back to the Octopus Web Portal and try Health Checking the affected machine again. If the service stops, it is likely that the service is crashing during startup; this can be caused by a number of things, most of which can be diagnosed from the Tentacle log files. Inspect these yourself, and either send the log files or extracts from them showing the issue to the Octopus Deploy Support email address for assistance. If the service is running, continue to the next step. To verify the communication settings, On the Tentacle machine, open the Tentacle Manager application from the Start screen or Start menu. Ensure that the Tentacle is in Listening mode. Below the thumbprint, you should see the text This Tentacles listens for connections on port 10933. Check the port that the Tentacle listens on. Check that the Octopus Server thumbprint shown in light gray in the Tentacle manager matches the one shown in the Configuration ➜ Thumbprints screen in the Octopus Web Portal. Note, that there are two thumbprints displayed - that of the Tentacle itself (shown first in bold) and the thumbprints of trusted servers (shown inline in the gray text). If any of the communications settings are incorrect, choose Delete this Tentacle instance.... After doing so, you'll be presented with the Tentacle installation wizard, where the correct settings can be chosen. If the settings are correct, continue to next step. Check the port that the Tentacle polls the Octopus Server on. Verify that the Tentacle's thumbprint, shown in bold in the large box, matches any that have been presented in error messages, and in the Machine Settings page on the Octopus Web Portal. To help with diagnostics, we've include a welcome page you can connect to from your web browser. The process of connecting is slightly different depending on if you are using a listening Tentacle or a polling Tentacle. If you're presented with a prompt to "confirm a certificate" or "select a certificate" choose "Cancel" - don't provide one. If you're presented with a warning about the invalidity of the site's certificate, "continue to the site" or "add an exception" (Octopus Server uses a self-signed certificate by default). On the Tentacle machine, open a web browser and navigate to https://localhost:10933 (or your chosen Tentacle communications port if it isn't the default). Make sure you use an HTTPS URL is used. The page shown should look like the one below. If you can't browse to the page... If this is where your journey ends, there's a problem on the Tentacle machine. It is very likely that the Tentacle is unable to open the communications port, either because of permissions, or because another process is listening on that port. Using the Windows netstat -o -n -a -b command can help to get to the bottom of this quickly. If you're still in trouble, check the Tentacle log files and contact Octopus Deploy support. Next, repeat the process of connecting to the Tentacle with a web browser, but do this from the Octopus Server machine. First try using the Tentacle's DNS hostname, e.g. https://my-tentacle:10933. If this fails, try using the Tentacle's IP address instead, e.g. https://1.2.3.4:10933 - success using the IP address but not the DNS hostname will indicate a DNS issue. If you can't connect... Failing to connect at this step means that you have a network issue preventing traffic between the Octopus Server and Tentacles. Check that the Tentacle port is open in any firewalls, and that other services on the network are working. There's not usually much that Octopus Deploy Support can suggest for these issues as networks are complex and highly varied. Having the network administrator from your organization help diagnose the issue is the best first step. If that draws a blank, please get in touch. Remember to check both the built-in Windows Firewall, and any other firewalls (in Amazon EC2, check your security group settings for example). On the Octopus Server machine, open a web browser and navigate to https://localhost:10943 (or your chosen Tentacle communications port if it isn't the default). Make sure an HTTPS URL is used. If you've made it this far, good news! Your Octopus Server is running and ready to accept inbound connections from Polling Tentacles. If this is where your journey ends, there's a problem on the Octopus Server machine itself. It is very likely that the Octopus Server is unable to open the communications port, either because of permissions, or because another process is listening on that port. Using the Windows netstat -o -n -a -b command can help to get to the bottom of this quickly. If you can see connections being opened and immediately closed (CLOSE_WAIT state in netstat output) from the same Foreign Address, it might indicate that this server is blocking traffic from the communications port and therefore resetting the connection immediately. Check both the built-in Windows Firewall, and any other firewalls (in Amazon EC2, check your security group settings for example) on the server identified by the Foreign Address in netstat and make sure that the communications port isn't being blocked. You can also use Wireshark to inspect traffic that is coming in on the Octopus Server communications port to find any connections that are being immediately reset by starting a network capture and filtering the traffic by tcp.port == 10943 (or your chosen Tentacle communications port if it isn't the default), this should identify any incoming requests that gets reset immediately. If you're still in trouble, check the Octopus Server log files and contact Octopus Deploy support. Next, repeat the process of connecting to the Octopus Server with a web browser, but do this from the Tentacle machine. First try using the Octopus Server's DNS hostname, e.g. https://my-octopus:10943. If this fails, try using the Octopus Server's IP address instead, e.g. https://1.2.3.4:10943 - success using the IP address but not the DNS hostname will indicate a DNS issue. If you can't connect... Failing to connect at this step means that you have a network issue preventing traffic between the Tentacles and Octopus Server. Check that the Octopus Server polling port is open in any firewalls, and that other services on the network are working. There's not usually much that Octopus Deploy Support can suggest for these issues as networks are complex and highly varied. Having the network administrator from your organization help diagnose the issue is the best first step. If that draws a blank, please get in touch. If the Tentacle welcome page is shown, good news - your network is fine. Octopus and Tentacle use TCP to communicate, with special handling to enable web browsers to connect for diagnostic purposes. Full HTTP is not supported, so network services like SSL offloading are not supported, and proxies are not supported in earlier versions of Octopus Deploy. Make sure there's a direct connection between the Octopus Server and Tentacle, without an HTTP proxy or a network appliance performing SSL offloading in between. NOTE: Octopus 3.4 introduced advanced support for HTTP proxies. We have built a small utility for testing the communications protocol between two servers called Tentacle Ping. This tool helps isolate the source of communication problems without needing a full Octopus configuration. It is built as a simple client and server component that emulates the communications protocol used by Octopus Server and Tentacle. Run TentaclePing on your Octopus Server machine (which is the client in this relationship). Run TentaclePong on your Tentacle machine (which is the server in this relationship). Use the output to help diagnose what is going wrong. Run TentaclePing on your Tentacle machine (which is the client in this relationship). Run TentaclePong on your Octopus Server machine (which is the server in this relationship). Your Octopus Server or Tentacle Server may have multiple IP addresses that they listen on. For example, in Amazon EC2 machines in a VPN might have both an internal IP address and an external addresses using NAT. Octopus Server and Tentacle Server may not listen on all addresses; you can check which addresses are configured on the server by running ipconfig /all from the command line and looking for the IPv4 addresses. If Tentacle fails to start with an error message like this: A required communications port is already in use. The most common scenario is when you already have an instance of Tentacle (or something else) listening on the same TCP port. However, we have seen cases where there is no running Tentacle in the list of processes. In this very specific case it could be due to a zombie PowerShell.exe or Calamari.exe process that was launched by Tentacle that is still holding the TCP port. This can happen when attempting to cancel a task that has hung inside of Calamari/PowerShell. Simply rebooting the machine, or killing the zombie process will fix this issue, and you should be able to start Tentacle successfully. Take a look at this thread for more background and troubleshooting tips. If the Tentacle is running as the Local System account you can skip this section. If the Tentacle is running as a specific user, make sure that the user has "full control" permission to the Octopus Home folder on the Tentacle machine. This is usually C:\Octopus - apply permissions recursively. For polling Tentacles we need to check the Octopus Server is running as the Local System account. If it is, you can skip this section. If the Octopus Server is running as a specific user, make sure that the user has "full control" permission to the Octopus Home folder on the machine. This is usually C:\Octopus - apply permissions recursively. In some DMZ-style environments without Internet access, failing to disable Windows code signing certificate revocation list checking will cause Windows to pause during loading of the Octopus applications and installers. This can have a significant negative performance impact, which may prevent Octopus and Tentacles connecting. If the command help is not displayed immediately (< 1s) you may need to consider disabling the CRL check while the Tentacle is configured. 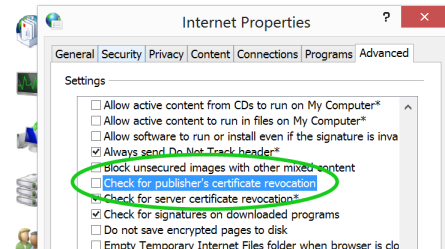 To do this open Control Panel ➜ Internet Options ➜ Advanced, and uncheck the Check for publisher's certificate revocation option as shown below. If the command help is not displayed immediately (< 1s) you may need to consider disabling the CRL check while the Octopus Server is configured. If a Tentacle health-check fails with an error message containing this error message, then there is network infrastructure inserting a web page into the communication. The most common components to do this are firewalls and proxy servers so it's recommend to check your network setup to verify connectivity between the two servers using the information above and then update your infrastructure appropriately.